Mabel M. Reynolds Nature Preserve sign. The Mabel M. Reynolds Nature Preserve , on both sides of Benson Road, and Reynolds Road, in the southwest part of the Town of Skaneateles, contains about 123 acres of woodland. The Mabel M. Reynolds Nature Preserve satellite view (USGS 2012). 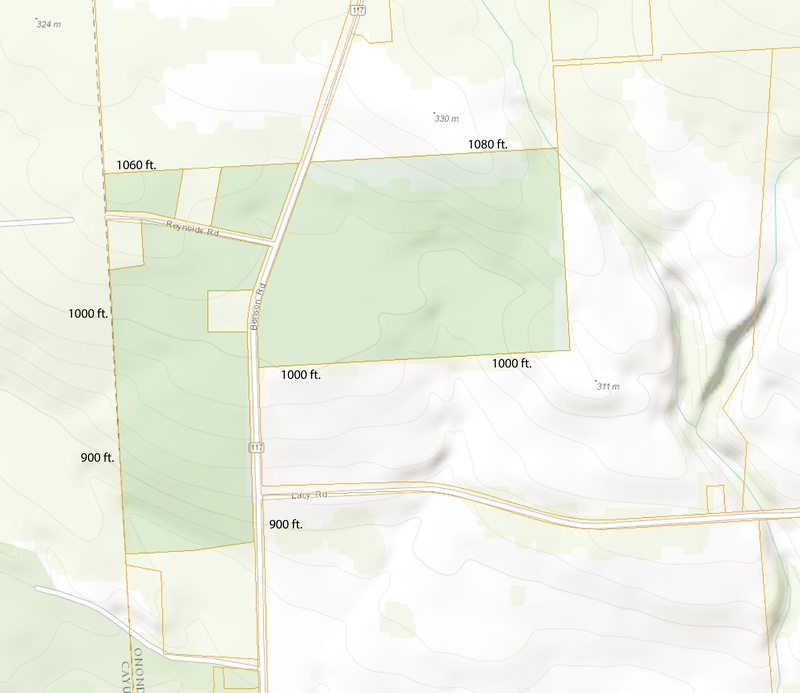 Mabel M. Reynolds Nature Preserve contour map (USGS-ESRI). Mabel M. Reynolds Nature Preserve forest-type map with tree stands as inventoried in 2006 by DEC forester Charles K. Porter. His detailed descriptions and recommendations for the stands are shown below. 1. 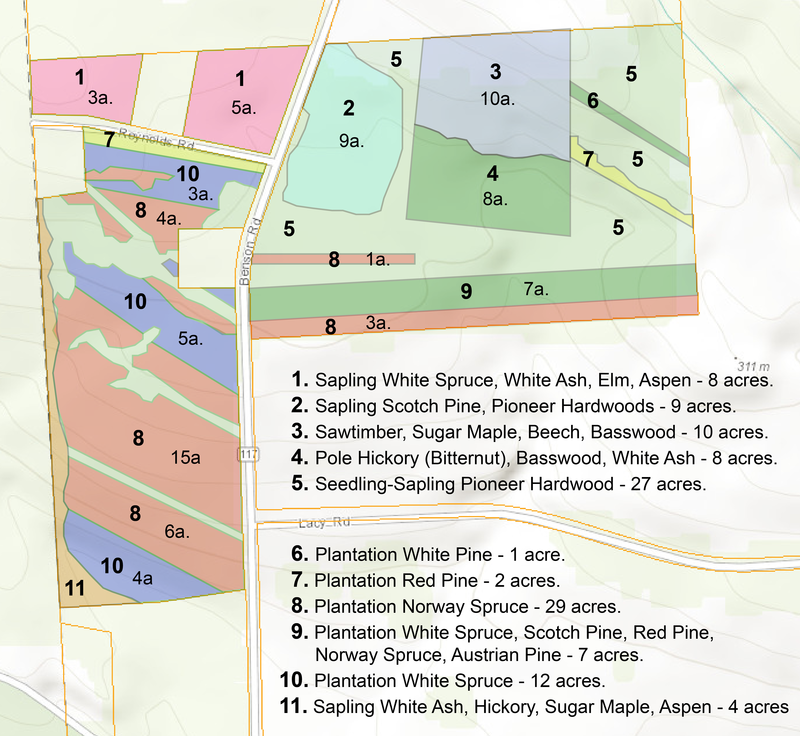 Sapling white spruce, white ash, Norway spruce, elm, aspen, 8 acres. Overstocked, good site, unknown quality, pioneer hardwood, old field, even aged. This is a variable stand. There are areas of thick spruce and areas of low density hardwoods. This stand is very good for wildlife as it is now. No recommendations for this. 2. Sapling Scotch pine, pioneer hardwoods, 9 acres. Overstocked, good site, fair quality, plantation/hardwood, old field, even aged. The Scotch pine can be expected to die off in the future. It doesn’t seem to be very well adapted to conditions in this area. Scotch pine is well known as a “nurse crop” for the establishment of hardwoods. It casts a light shade and probably modifies the soil so that conditions are good for seedlings. In nature, pine seeds in on areas of forest fires or blow down. It has to have full sunlight to become established. It is normally replaced by hardwoods as it reaches the age of physiological over maturity. The process is happening in this stand. No recommendations, let nature take it’s course. 3. Sawtimber sugar maple, beech, basswood, 10 acres. Well stocked, good site, good quality, northern hardwoods, grazed forest, uneven aged. This is the only natural forest area on the property, all the rest was cleared for field or pasture. There is just enough slope here that surface drainage is good. It was harvested before the Town acquired the property. The residual is of good quality. The only concern with this area is that the reproduction (and therefore the future forest) will be mostly beech. It is one of the effects of Beech Bark Disease that, as they are killed slowly, beech trees sprout vigorously from their roots. Since they are shade tolerant and are not browsed by deer in winter (almost no food value, starvation browsing only) they tend to dominate the future forest. Unfortunately, beech in the future will only get to 8″ in diameter before the insect attacks it and the fungus kills it (like elm and the Dutch Elm Disease). This leads to the establishment of what are called “beech thickets”. These areas are not very useful for anything. Recommend looking at this stand in two years time to see if the problem is serious here. Hunting is useful to control deer population levels. Because of the excellent thermal cover of the spruce plantations here, deer are concentrated on this property in winter. It is probably similar to the spruce-fir deer yarding areas in the Adirondacks. Deer browse on the buds of seedlings to survive through the winter when snow covers their summer food. They will not browse on beech unless they are starving. On properties with a population higher than the caring capacity of the land, hardwoods (like sugar maple) and some shrub species are just not present in the understory. This creates a problem for wildlife now and for people in the future. 4. Pole bitternut hickory, basswood, white ash, 8 acres. Overstocked, good site, good quality, northern hardwoods, old field, even aged. nus stand could be thinned but it is not a desperate case. This stand is flat and has some wet areas in the southeast comer. The most well adapted species to this shallow soil site is probably basswood. It should be favored over the other species. 5. Seedling-sapling pioneer hardwood, 27 acres. Well stocked, good site, unknown quality, pioneer hardwood, old field, even aged. This is old field which has seeded in to hardwoods and shrubs. It is valuable habitat for many species as it is now. This property is favorable for wildlife because it has a diversity of vegetation types and succession stages. Possibly parts ofthis area could be bush hogged once every three years to keep it in an early succession stage. Another thing which could be done is to cut hardwood trees which are shading out wild apple trees. Apple doesn’t grow that tall so it is killed when the hardwoods overtop it. There is one section on the east boundary of this stand which has white spruce planted on it. This was probably a later planting. This spruce will probably be shaded out by the sapling hardwoods there. 6. Plantation white pine, 1 acre. Overstocked, good site, fair quality, plantation, old field, even aged. No recommendations for this now. In the future it will need thinning to select the straight stems. White pine is attacked by an insect which kills the central leader of the tree. This forces one of the side branches to take over as leader. That causes the trunk of the tree to be crooked. The insect does not attack once the tree is 25 feet tall. White pine is well adapted to this site. It is the largest conifer in the northeast. Eventually these trees will be valuable for the aesthetics of having large, very tall trees. 7. Plantation red pine, 2 acres. Overstocked, good site, good quality, plantation, old field, even aged. Red pine is one of the hard pines. It has a tap root like a carrot. It is not well adapted to the soils here. It needs a deep, well drained soil to grow well. These trees will be short lived and will not get very large. No recommendations for these areas. 8. Plantation Norway spruce, 29 acres. Overstocked, good site, good quality, plantation, old field, even aged. Norway Spruce is very well adapted to these soils. They grow rapidly and are healthy. This plantation has a good future. This stand is in need of thinning. Thinning will double or triple the growth rate on the trees left to grow, and we get the chance to pick the highest quality trees to leave. Plantations start with a thousand trees per acre and eventually there is only room for about 200. If we don’t thin them out, nature will do it for us, except much more slowly and often favoring the poorest quality and least valuable trees. Often poor quality hardwood trees in plantations grow taller than the planted trees. When this happens, the conifers will be shaded out and killed. The poor quality hardwoods should be cut to give the spruce full sunlight. If there are straight stemmed black cherry present then they should be favored over the spruce. These areas are very valuable for wildlife thermal cover. Wildlife biologists say that the best cover is when the trees are small and up to the point where they still have live branches with needles on them at a height of 15 feet. This stand is beyond that point but it is still valuable. Thinning will let some light reach the ground and get some seedlings and herbaceous plants started. There isn’t any understory vegetation now. This stand would be a good timber investment if it were thinned out. They will be a lot of useful timber here in the future. 9. Plantation white spruce, Scotch pine, red pine, Norway spruce, Austrian pine, 7 acres. Overstocked, good site, good quality, plantation, old field, even aged. The species which are adapted to these soils are Norway spruce and white spruce. They should be favored in thinning. The pines will be short lived here. This is probably more valuable for wildlife than for anything else. It may be that the most useful action here would be to leave this undisturbed. 10. 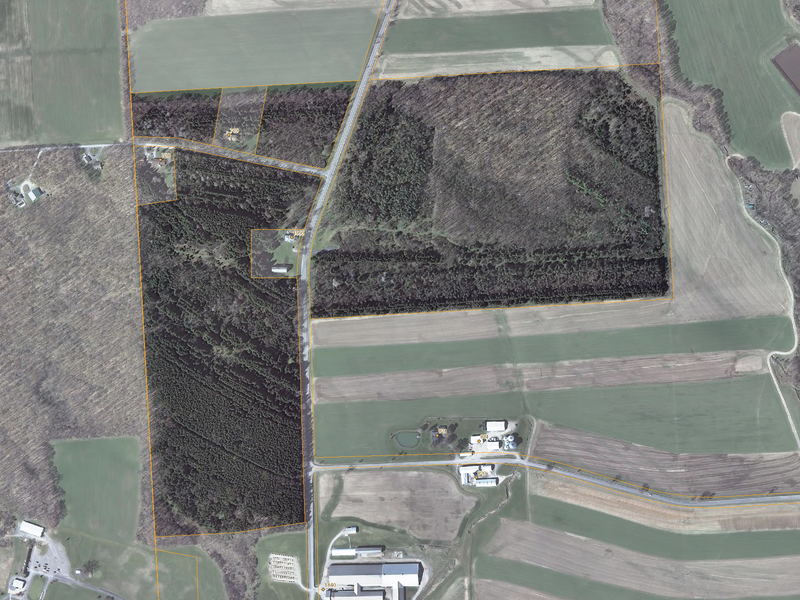 Plantation white spruce, 12 acres. Overstocked, good site, good quality, plantation, old field, even aged. These plantation areas are fairly well-stocked and growing well. White spruce plantations make a thick cover for wildlife of all species. White spruce grows slowly at first so some hardwoods usually seed in. The recommended management is to do timber stand improvement to get rid of the hardwoods. This will let the spruce grow thicker to make better cover for animals and to make better timber in the future. White spruce grows slowly at first and then, at some point, it takes off and begins to grow rapidly. That hasn’t happened here yet but it will. 11. Sapling white ash, hickory, sugar maple, aspen, 4 acres. Overstocked, good site, good quality, pioneer hardwood, old field, even aged. This is young hardwood which has seeded in from the older trees in the fence line and the forest beyond it. They are useful as a seed source to eventually replace the conifers. This doesn’t really need thinning yet, it is not that dense.